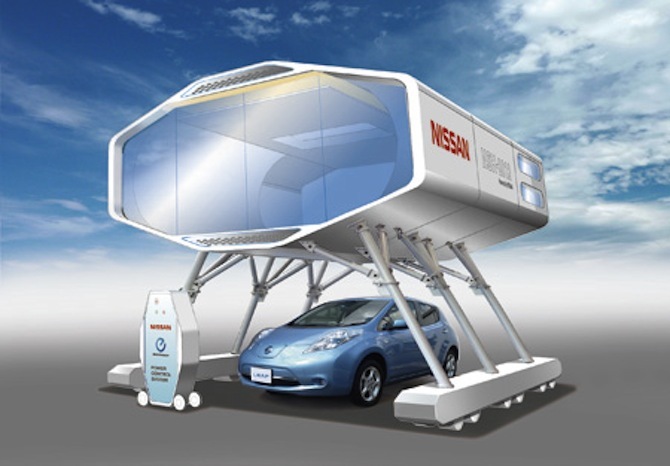 If you’re worried about natural disasters and energy dependence, Nissan’s got a car and a house to sell you in the most exclusive of communities. The automaker is displaying the NSH-2012 (above) as the “Smart House” of the future at CEATEC Japan (Combined Exhibition of Advanced Technologies) 2011. It’s the centerpiece of Nissan’s Standalone Energy Community exhibit along with Smart Healthcare, Smart Cottage, Smart Rental Car and Smart Food Stand. The house, inspired by both modern aircraft fuselage design and ancient Japanese homes, has a polyhedral structure that’s resistant to disasters, and there’s a Leaf EV at its heart. Energy independence has taken on new significance and urgency in Japan since the Fukushima disaster, so each one of the buildings in the Energy Community relies on solar, fuel cell or wind power. Although the buildings are all designed to be self-sufficient, the Leaf is central to their existence as a community. 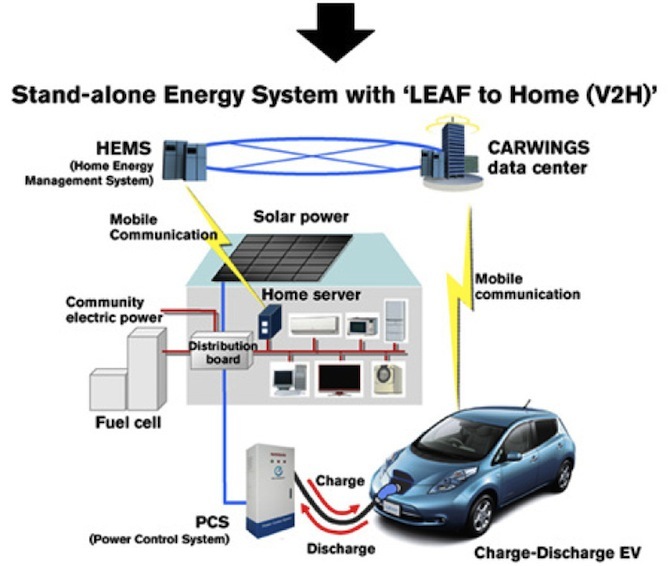 Through the Leaf to Home charging system, the car acts as a battery backup if a solar system can’t generate enough power on a rainy day — or worse. “This home can maintain stable in-house power supply that is not affected by weather, and can rely on solar power and power stored in an EV’s batteries if power is cut off during a disaster,” the company said. When all is going well, a smart-grid setup funnels energy to and from individual power generation stations — and to and from plugged-in Leafs for low-emission charging.